Form Constancy refers to the ability to recognize and label objects even when they are viewed from a different angle or in a different environment. A simple example would be that you can recognize that a dog is a dog whether you see it in a photo, in your garden or in the park, and whether it is sitting, lying down or running. Labeling the object correctly means that this skill has both a visual perceptual demand and a verbal demand. 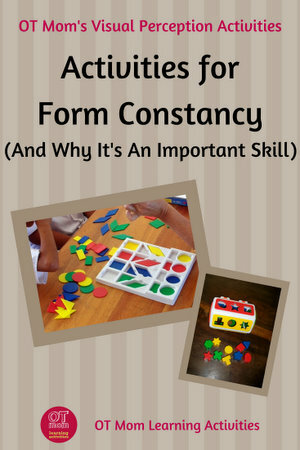 How does poor form constancy affect kids? or when they are presented in a different context (for example when they see them in the playground instead of in the classroom). There is a difference between this and form perception. Form Perception is more of a "gestalt" term used by psychologists and artists and refers to our ability to see objects, and to perceive their characteristics (such as rounded and straight edges). First make sure your child understands what makes a shape special (eg a circle is round; a triangle has 3 corners). For very young children, introduce just one shape at a time - conventional wisdom says one shape a week! Try a tactile perception activity and ask your child to identify the shape that he/she can feel inside a feely bag. Ask your child to point out the different objects in your home that are a specific shape (eg a clock may be a circle, a table may be a rectangle). This child has identified 2 rectangles on the wall. If your child finds it too hard to recognize forms in a busy room, place some household items on a tray and ask your child to pick out specific shapes. This tray has some triangles and ovals. Use picture books and ask your child to find the different shapes in the picture. Use a shopping catalog or magazine, and ask your child to point out objects that are a specific shape. Take a walk through town or your neighborhood and let your child spot the current number or letter that you are studying. Let your child raid your pantry, and find the current number or letter on the packaging. 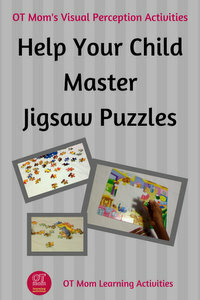 Let your child look for specific numbers or letters in magazines, catalogs, on your calendar and so on. Let your child cut them out and paste them into a notebook, or you could cut them out for your younger child if this is too demanding. 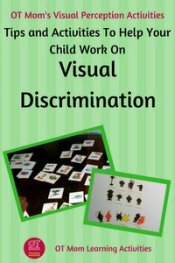 Some worksheets require the child to find objects that are the same even though viewed from a different perspective. 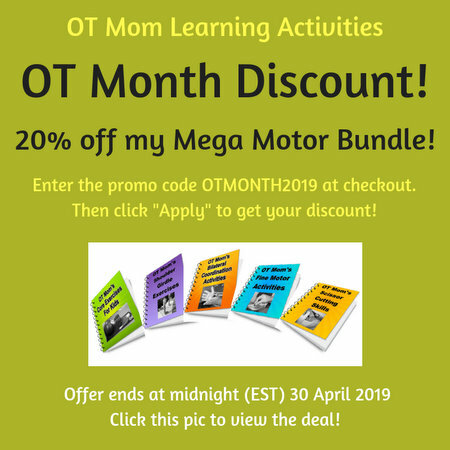 Some worksheets require the child to identify all the objects that are a particular shape (eg clocks and wheels are circles; picture frames and books are rectangles), or to find all the specific shapes on the page. 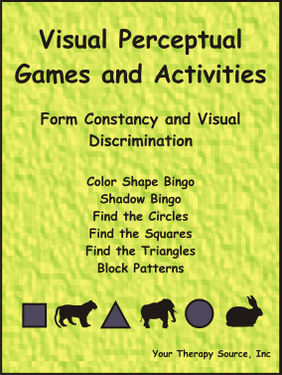 The form constancy worksheet immediately above (that my child colored in), came from Visual Perceptual Games and Activities, which is a reproducible, downloadable workbook. 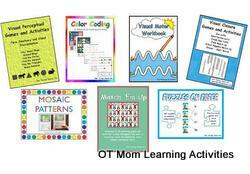 These other pages on my site give lots of visual perception activity ideas and resources to build your child's skills. Have fun! 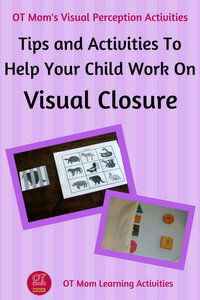 PFOT stock a range of visual perceptual toys and games that can help build your child's skills. You can check out my favorite resources on this page! There is sometimes a place for desktop worksheet activities in preschool, although I prefer to use worksheets as little as possible at this age. You can check out my favorite printable worksheets on this page! I link to some products on Amazon for your convenience. These are affiliate links and I receive a small commission if you purchase a product through my links. However, you are under no obligation to purchase anything! I trust you found these suggestions helpful! Please read my page on Visual Perceptual Skills if you need more information about why all of these skills are so important for kids.